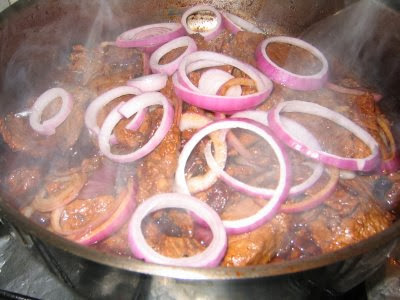 Bistek Tagalog is a very popular, and one of the best beef recipes of the Filipinos. The word Bistek is a slang Filipino word for “Beef Steak”, also means beef in Spanish. This T-Bone Bistek is somewhat leveled-up from the usual Bistek. Simple to make, nothing exotic in the ingredients list, and you'll wonder how you ever got along without it. 1. De-bone the steaks then slice it into fairly thin pieces (the thinner the quicker to cook). Marinate the beef pieces in 2 tablespoons of soy sauce and 1 tablespoon calamansi juice. Leave for about half an hour. 2. Heat up a little bit of oil using a pan with a fairly thick base. Sear the marinated beef a few pieces at a time to avoid steaming the meat. Set aside the seared meat. 3. Cook half the onion rings in the same pan. Add a bit more oil if necessary. Wait until the onions start to caramelize. 4. Add the seared meat back in the pan. Add the remaining soy sauce, calamansi juice and black pepper and cook for another 2 minutes. 5. Arrange beef slices on a plate. Place the remaining onion rings on top. Pour the sauce over the onions and beef. Serve at once with rice.